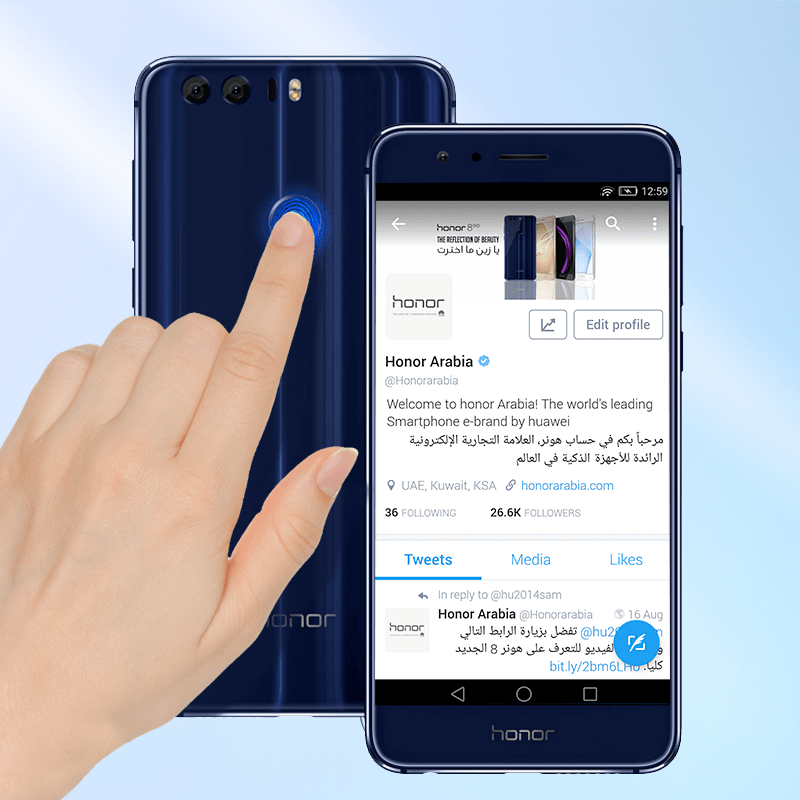 Jeddah: Huawei honor and Twitter are partnering to provide built-in fast access to the Twitter app, which will be pre-loaded on honor 8. The new flagship honor 8 has been pre-programmed to open Twitter which comes as a preloaded app; in a fraction of a second via its custom smart key – a function exclusive to the Middle East. Users can access the social media app by double clicking the smart key, which has been incorporated into its 3D fingerprint sensor for slick functionality. It has a 0.4 second unlock capability, auto learning skill set and can be customised with up to three easy access options. The fingerprint sensor also offers NFC tag read and writer, P2P transfer and SIM / HCE-based mobile payment, providing a greater accessibility to mobile internet. honor strategically balances innovative features and high-performance, with a fresh design and an attractive price point. The honor 8 embodies this approach with its cutting edge, smart technology, as well as phenomenal aesthetical appeal, boasting a stunning glass exterior priced at AED [KR1] 1599. The 3D grate design has been created with a resilient two-sided 2.5D, 15 layer glass body, which reflects light producing an aurora effect with intricate patterns, meaning no two phones appear the same. The world-class camera features and intuitive software – a 12 MP dual camera with RGB and monochrome sensors, as well as its 8MP wide-angle front-facing camera – offers seriously impressive functionality. Its 3,000 mAh battery with Smart Power 4.0 maximises stand-by time allowing the honor 8 to keep going for up to 1.22 days of heavy usage. Just ten minutes of charging will allow two hours call time, and 30 minutes will re-charge the device to 47%. The honor 8 also boasts 8-core CPU up to 2.3 GHZ, 4GB RAM, Kirin 950, i5 CO processor and Rapid-Smart file processing system. The world class flagship device is available on HonorArabia.com. Huawei honor is the world’s No 1 smartphone e-brand and in three years honor entered more than 74 countries and continues its rapid expansion into new and emerging markets. Revenue has catapulted to USD 2.63 billion and the number of units has increased to 20 million devices – a figure the brand is looking to double by the end of 2015[Office2] . Huawei honor is set to revolutionise the Middle East smartphone market and changing its landscape through its e-commerce only business model. Huawei honor believes in digital, and aims to allow more people to enjoy the wonderful connected digital world. It is able to connect directly to its consumers, spending more of its resources focusing on users’ needs and developing superior products and services. The underlying philosophy of the brand highlights the courage, the passion and vibrancy of our audiences. The courage to aspire to be yourself, the passion to pursue the aspirations and the vibrancy exhibited in the raring to go attitude. It is a brand “For the Brave”. Twitter, Inc. (NYSE: TWTR) is what’s happening in the world right now. From breaking news and entertainment to sports and politics, from big events to everyday interests. If it’s happening anywhere, it’s happening first on Twitter. Twitter is where the full story unfolds with all the live commentary and where live events come to life unlike anywhere else. Twitter is available in more than 40 languages around the world. The service can be accessed at Twitter.com, on a variety of mobile devices and via SMS.